The Kawartha Sexual Assault Centre, Fleming College and partner organizations are encouraging community members to step up, speak out and take a stand against sexual violence. 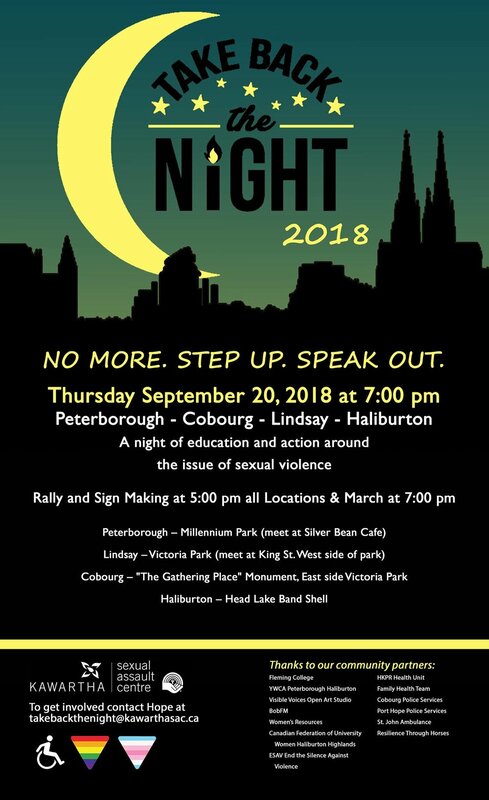 This candlelight vigil and walk, which will take place in Peterborough, Lindsay, Cobourg and Haliburton, welcomes survivors of sexual violence and harassment, their supporters and allies to join together in solidarity. In the wake of local issues of sexual assault, online luring and sexual harassment, changes to campus policies on sexual violence and harassment, and recent high profile sexual assault trials, the Centre and College welcome participants to join together to build a more healing and inclusive community. The annual Take Back the Night event will take place starting at 7 p.m. on Thursday, September 20, 2018. This free event includes a rally with speeches, musical performances, and spoken word poetry followed by the ‘Light Your Way’ solidarity walk at 7:30 p.m. Come early for pre-rally poster making, supplies available on site! Peterborough – Millennium Park (meet at Silver Bean Cafe), 130 King St.
Lindsay – Victoria Park (meet at King St., west side of park), 207 Kent St W.
Cobourg – "The Gathering Place" Monument, east side of Victoria Park, Cobourg. Haliburton – Head Lake Band Shell (enter from York St. suggested). BONUS! Get ready for Take Back the Night on the evening of Wednesday September 19 at Haliburton Highlands Secondary School, beginning with refreshments and information booths in the lobby at 6:00 pm with a screening of the film “A Better Man” to play at 6:30 pm. This film is for a 14+ audience. Following the screening, there will be a panel discussion with community social service providers to create a dialogue around the issue of sexual violence. Childcare will be provided by Kawartha Sexual Assault Centre volunteers. For more information, check out our Facebook events, the Kawartha Sexual Assault Centre website (www.kawarthasexualassaultcentre.com) or call the Centre at 705-748- 5901.